Camping Las Grullas is a naturist campsite in the heart of Extremadura where you can enjoy the beautiful nature and the cultural Unesco sites. If you are seeking peace and quiet, wish to spot birds or enjoy the heavens in the evening, then visit us in Spain! Naturist campsite Las Grullas is a quiet and small-scale site for lovers of nature and culture. Charmingly situated on an old estate amongst holly oaks and granite formations. The site is 2,6 hectare large, a part for camping and a part natural. Las Grullas is situated 2,5 km from the through roads, so your peace and quiet will not be disturbed. The cottage is a small rural Stone house, ideal to enjoy the natural surroundings. 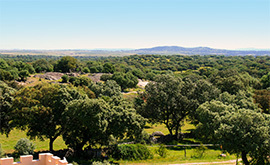 It stands on a separate part (10.000 m²) of our estate with holly oaks and granite formations, directly behind the camp site. You can park the car next to the house. 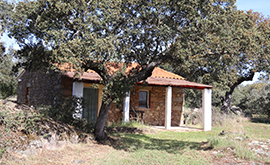 The cottage is suitable for 2 people and is 54 m² large. The north of Extremadura is a paradise for walkers and mountain bikers. Discover the virginal scenery here and enjoy the endless panoramic views. If you love mountains and valleys, lakes, rivers or forests: you can enjoy all of this in Extremadura. Some walking and cycling routes start directly outside the camp site. Other routes start from less than a 30 minute drive.